Adi Enders was born Adolf Hermann Enders on April 16, 1935 in Köln (Cologne), Germany, to an old family of circus equestrians. His parents were Hugo Enders (1899-1952), a jockeyClassic equestrian act in which the participants ride standing in various attitudes on a galoping horse, perform various jumps while on the horse, and from the ground to the horse, and perform classic horse-vaulting exercises. and horse trainer, and Alma von der Gathen (1905-1944). Adi had five siblings: Rudolf, known as Rudi or "Männe" (February 22, 1927 - April 5, 2004, Aachen), who became an animal trainer; Jean, known as "Schengel" (April 9, 1929, Alsdorf - March 3, 2004, Breinig) who became a clown under the name of Pipo; Willi (1932 - December 6, 1988); and Jakob, known as Jacomo or Jacky (May 8, 1938 Neustadt an der Weinstraße - November 24, 1994) who became a jockeyClassic equestrian act in which the participants ride standing in various attitudes on a galoping horse, perform various jumps while on the horse, and from the ground to the horse, and perform classic horse-vaulting exercises., but would also be known for his plate-spinning act, and as a clownGeneric term for all clowns and augustes. '''Specific:''' In Europe, the elegant, whiteface character who plays the role of the straight man to the Auguste in a clown team. ; and his sister, Medi (born February 19, 1928). Adi and Jakob Enders grew up in the family of their aunt, Maria Althoff, née von der Gathen (1908-1999), who was Alma’s sister and was married to the circus director and animal trainer Adolf Althoff (1913-1998). Adi was trained in acrobatics by Mohamed "Momo" Saharaoui Faroki, who was a member of the Ben Mohamed Troupe, a Morrocan tumbling act, and by his uncle Adolf, who took care of his education in equestrian arts and animal training. In the 1950's and 1960's, Adi Enders was considered one of the world’s finest jockeys. He and his brother Jakob performed for many years their jockeyClassic equestrian act in which the participants ride standing in various attitudes on a galoping horse, perform various jumps while on the horse, and from the ground to the horse, and perform classic horse-vaulting exercises. act as Gebrüder Enders (The Enders Brothers), or sometimes as Enders Reitertruppe. (When they toured in 1956 with Circus Scott-Williams they were billed as Williams Reitertruppe.) They had various partners over the years, among whom Carla Barlay (who married Francois Bronett, later Director of Cirkus Scott) and Günther Gebel. For a long time, they also had for partner Claus Lehnert, who would later become Circus Krone’s operations manager. 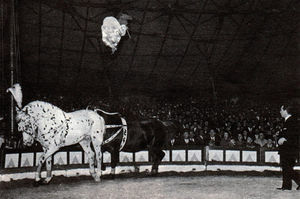 In December 1957 in Paris, Adi Enders was awarded the "Oscar Mondial du Cirque" for his jockeyClassic equestrian act in which the participants ride standing in various attitudes on a galoping horse, perform various jumps while on the horse, and from the ground to the horse, and perform classic horse-vaulting exercises. act, during the Enders Brothers engagement with the Grand Cirque 57, produced by Hibert de Malafosse and Jérôme Medrano at Paris’s Palais des Sports. The award, created by Arturo Castilla, was the only recognized circus award at the time. A superlative classic jockeyClassic equestrian act in which the participants ride standing in various attitudes on a galoping horse, perform various jumps while on the horse, and from the ground to the horse, and perform classic horse-vaulting exercises., Adi Enders was especially famous for his impeccable somersault from horse to horse. At Circus Williams, where he performed during the touring season for a large part of his jockeyClassic equestrian act in which the participants ride standing in various attitudes on a galoping horse, perform various jumps while on the horse, and from the ground to the horse, and perform classic horse-vaulting exercises. career, Adi also took part in Holdy Barlay's cowboy act. Additionally, he performed as a clown together with his brothers. The Enders Brothers had also successful winter engagements in major circuses all over Europe. During the winter of 1962-63, they participated in a cultural-exchange circus tour in the USSR, which took them to Kiev, Odessa, and Moscow—where they performed for the Soviet President, Nikita Khrushchev. From 1966 to 1971, they were a featured act with Circus Krone, in Germany. Over the years, Adi performed in Austria, England, Scotland, France, The Netherlands, Belgium, Luxembourg, Sweden, Hungary, and Poland. The end of their long engagement with Circus Krone also marked the end of the Enders’ jockeyClassic equestrian act in which the participants ride standing in various attitudes on a galoping horse, perform various jumps while on the horse, and from the ground to the horse, and perform classic horse-vaulting exercises. act. In 1972, Adi and his brothers Rudi and Jakob launched the Circus Festival-Gebrüder Enders, which was unfortunately short-lived. Then Adi began a successful career as an animal trainer, specializing in the presentation of horses and elephants. He worked for Circus Carl Althoff, and from 1976 on, became a major player with the new Circus Williams-Althoff, ran by his cousin, Franz (Franzi) Althoff. In 1984, Adi Enders was awarded the Prix Jean-Louis Marsan for his elephants and rhino act at the International Circus Festival of Monte Carlo. In the 1980's, he also took over his cousin Evi Althoff’s tiger act (Evi was Franzi Althoff's wife). Adi and his wife, Hana—the daughter of the famous Czech opera tenor, Beno Blachut (1913-1985)—subsequently raised several baby Siberian tigers. Adi retired from performing in 1992. He also retired his Williams-Althoff elephants to the Zoo-Safaripark Stukenbrock, near Bielefeld in Germany. He has since settled at the Zoo-Safaripark, and is still active there.